We are one of the blogs revealing the cover for the YA novel, Abandon (Possession, #3), by Elana Johnson and Simon Pulse. Expected release is June 2013. The event host for this cover reveal is AToMR Tours. Isn't that a lovely shade of purple? And the flower in the test tube is mysterious. 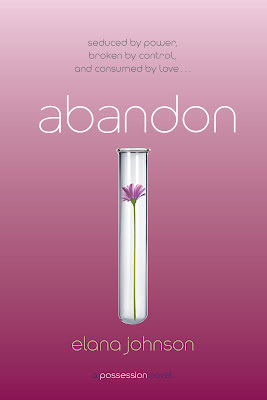 Add Abandon to your Goodreads list. Possession by Elana Johnson on Facebook). Love Elana's cover! So excited for her.